There’s a title I don’t want to write ever again. But that’s where we’re at, thanks to the illustrious Jack Edwards and his unfortunate access to a radio signal. So, yes, Alex Burrows wasn’t suspended and it seems like everyone’s pretty ticked about it. (Message received. Gross miscarriage of justice, etc etc.) But that’s cool. Everyone’s entitled to their opinion. And at least no one’s written me anything as insane as in the audio below, kindly provided by Matt Yoder at Awful Announcing. This audio from Jack addresses Vancouver’s Alex Burrows biting the hand of Boston’s Patrice Bergeron. Surprisingly, Burrows was not suspended by the NHL. Thankfully though, the entire incident has given us this video of Jack Torrance… err… I mean Edwards, providing a poignant social commentary on the matter complete with some kind of circus music. By the way, congrats if you spun the Jack Edwards Wheel of Insanity and landed on Breastfeeding. Henrik Sedin leads the NHL in postseason scoring. Daniel Sedin is second in goals. “It’s pretty good for being the two worst playoff players in the league,” Henrik quipped. Sure is. Maybe it’s puppy power. More likely, it’s health. From today’s media Q&A with Canucks coach Alain Vigneault, Mason Raymond, Alex Burrows and Alex Edler. Q. Mason, when you look at the games, highly entertaining in the regular season. Is that the type of hockey you’re expecting? MASON RAYMOND: I think so. Regular season is regular season. Playoffs is a whole ‘nother level now. They’re going to be obviously heated battle games. We’ve had some good rivals with these guys. As a group, we’re looking forward to starting off Game 1. Q. Alex, just a couple of emotional rollercoaster rides. How easy is that for you to put that behind you? ALEX BURROWS: I think we’re a pretty mature group in that locker room. We’ve approached games the same way all year long, that’s one game at a time. Obviously I know it’s cliché, but that’s exactly how we approached things all year. I don’t think that’s going to change. Chicago series was great, Nashville, too. That’s behind us now. How can anyone not love the internet hockey world? Where else can you find such unbridled hatred and borderline psychosis on display? Quite entertaining. And while the remarks are largely nonsensical (“scabs”?? ), it’s easy to see what motivated the rant. And that wasn’t a criticism; it was sort of a compliment. Forward Alexandre Burrows has agreed to an $8-million, four-year contract extension with the Vancouver Canucks, a source told ESPN.com Tuesday. Burrows had been involved in trade rumors prior to Tuesday’s deal. He has been skating on the Canucks’ top line with Henrik and Daniel Sedin and seems to have clicked with the Swedish twins. There’s a lot of worry and wonder about whether Alex Burrows is on the trade block—primarily courtesy of Pierre LeBrun on HNIC this past weekend (or, as French Canadian Burrows calls him, “that Frenchman”)—and the Canucks popped up a video today with some players’ reaction to the rumors. While I personally almost never shut up about my appreciation of Alex Burrows, it often seems like most of the league (aside from Canucks fans obviously) has no idea who the guy is. Alex Burrows was my first and favorite current NHLer player interview. And Marc Crawford has been one of my favorite coaches. The Vancouver Canucks are pleased to announce the launch of the “7th Canuck” initiative to celebrate the passion of Canucks fans and their role in supporting the team over the years. Prior to each home game, one individual will act as an ambassador of Canucks fans and unveil the “7th Canuck” banner to symbolize the home-ice advantage Canucks fans provide to the team. A great idea and a nice gesture—but there was still a bit of confusion out there. 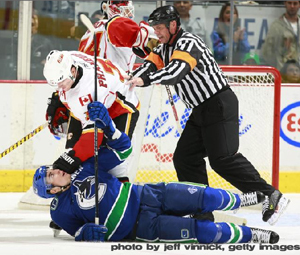 Last April, Vancouver finished the 2007-08 season with a dreary 7-1 loss to the Calgary Flames. This year they opened their new season by returning the favor, handing the Flames a 6-0 beating. The pre-game ceremony honoring Luc Bourdon was emotional (as expected) and a well done affair by the Canucks. And Tom Cochrane’s Big League was the perfect tribute. (You can watch the video the Canucks produced here; to see the whole ceremony at GM Place, go here and fast forward about 2 minutes). Burrows is scheduled to make a bargain basement $525,00 - and cap hit of only $483,000 - this season. It’s the third and final year of a deal he signed when he was a fringe player. He moved beyond that status in 2007-08 with 31 points and a team-leading plus-11. His point total placed him sixth among Canuck forwards. His 19 assists were fifth best. His 179 penalty minutes easily topped all Vancouver skaters. He’s big league now after battling his way up from minor league Greenville, Baton Rouge and Columbia in the U.S. south. Burrows’s story is one of my favorites, his journey into the league seeming so unlikely only a few short years ago. But I also have another attachment to Burrows—he was the first NHL player I ever had the pleasure of interviewing in person. Anaheim Ducks defenceman Chris Pronger could face disciplinary action from the National Hockey League after stomping on Vancouver Canucks centre Ryan Kesler on Wednesday night. The incident happened in the opening minute of the second period in Anaheim’s zone after a dump in from the blue line by Canucks defenceman Sami Salo. TSN reported earlier today that “Edmonton’s Steve Staios dodged a bullet” when the NHL decided not to suspend him for his slash on Alex Burrows, but simply leveled a fine. A bit surprising… but then again, maybe it’s all relative. There were other incidents that night—perpetrated by the Canucks themselves, even—that could have easily been up for review, I thought. The super-pest. The player everyone wants to have on their team, and the player nobody wants to face. Who is the NHL’s biggest “Pain in the Glass” these days? It just might be Alex Burrows of the Vancouver Canucks. TSN goes to break down the chaos Burrows created in the Tampa game last night: 2 assists and 9 penalty minutes in just 14 minutes of work. The article also takes a look at all the other troublemakers on their poll question. With that list, I didn’t even come close to voting for Burrows. With Todd Bertuzzi playing in Vancouver for the first time since he left the team, the game tomorrow night is far less about Vancouver being tested by the reigning Stanley Cup Champion Anaheim Ducks, and far more about the return of the big guy. So said the Hulk, beating his chest for the media yesterday. Too distraught initially to discuss his plight, Bieksa finally met reporters Tuesday at GM Place. Bieksa received stitches both inside and outside the leg - they come out Thursday - and will wear a hard cast for four to six weeks at which time he will be re-assessed. He was told the surgery wasn’t considered major, even though the injury is. There’s some discussion in the article about the possibility that the thinner socks being worn this season may have worsened the impact of Bieksa’s injury. It’s only speculation, but still a disturbing consideration. In other Canucks-related news this week: Luc Bourdon’s looking good, Taylor Pyatt has a cold and Alex Burrows ate a sandwich. Exciting stuff. Fortunately, they’re back in action tomorrow. It’s refreshing to observe a veteran NHL player, on a one-way contract, actually competing earnestly for his job in the pre-season. That’s what checking winger Alexandre Burrows is doing with the Vancouver Canucks as he’s pressured for playing time by up-and-comers. Burrows came out hustling, hitting and fighting in Vancouver’s first exhibition test Monday against the Anaheim Ducks, goading rising star Ryan Getzlaf of the Ducks into a fight that saw Burrows expelled while fans roared their approval. Not a surprise and I’m a big fan of Burrows. But what I do find mildly odd is referring to the guy - with just 1 full NHL season under his belt - as a “veteran.” Nonetheless, he’s certainly fought a hard battle to get where he is.